When a vehicle is a total loss or costs more to repair than its total value, you can obtain a vehicle salvage title. Later, if you rebuild or repair the vehicle to the satisfaction of your state's department of motor vehicles, the department will issue a rebuilt title for the vehicle. You can then register and operate your rebuilt vehicle on state roads. To ensure that rebuilt vehicles are road-ready, states mandate that your vehicle must pass an inspection before receiving the rebuilt title. Make copies of any receipts or paperwork that document the repairs you have made to the salvaged vehicle. Complete a request for rebuilt savage vehicle exam form. This form can be obtained from a department of motor vehicles office. Turn in the form and the copies of the repair documents to a DMV representative. Pay the vehicle inspection fee, which varies depending on your state. Allow the DMV special agent to inspect the vehicle for road readiness. Take the Examination Report that shows the vehicle passed the inspection to the DMV office. Pay the title fee, which varies depending on your state. Curtis, Michaele. 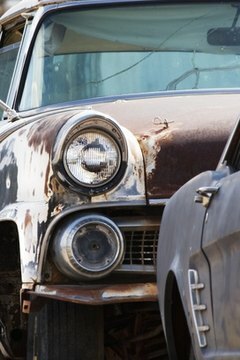 "How to Change a Salvage Title to a Rebuilt Title." , https://legalbeagle.com/6719800-change-salvage-title-rebuilt-title.html. Accessed 25 April 2019.